The Uinta Mountains are the only major mountain range in the lower 48 states, that trend in an east west direction. One paved road skirts its eastern end, historically sometimes called Uinta Summit. The higher Bald Mountain Pass goes over the range near its western end. Also designated Mirror Lake scenic byway by the tourist bureau, this road on the northern end of Utah is yet another branch in the tree of scenic diversity that makes up Utah. 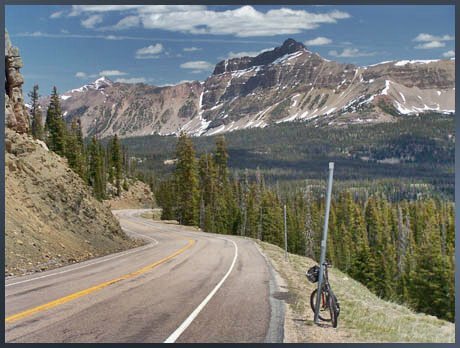 At 10700 feet it's not only the divide between the Duchesne River flowing eventually into the Pacific, and the Provo River emptying into the Great Basin, it is also the highest Rocky Mountain paved pass road outside of Colorado. This highest paved road in Utah is quite remote with plenty of camping opportunities in and outside of campgrounds, but practically no place to get provisions, outside of water, which is available at the campgrounds. There is a really narrow shoulder but traffic is generally light. But in the summer they all seem to be towing some unwieldy motor contraption. Parking a four wheeled vehicles inside this managed recreation area requires a user's fee - but it's reasonable - obtainable at self service station, 6 dollars for three days, 12 for a week (July/07). From East. The Uinta foothiills east of Kamas are a safe distance from the business traffic of Park City. This climb starts barely noticeable. But At the turnoff to Soapstone Pass, everything is still gentle rolling forest, though rolling upwards. As the route turns north it finally becomes evident that there are cliffs behind these forests. At Lily Lake conical mountains reach above timber line with peaceful lakes nestled at their feet. The landscape still has the appearance of a high plateau with lots of rounded knobs sitting on the table top. Unexpectedly the road enters forest again. The final part of the climb includes a few switchbacks and far views stretching as far as the the southern Wasatch Range Peaks. The white block of Mount Timpanogos is partially hidden behind a straight black cliff with lake at its base. Between here and the Wasatch Range stands an expanse of forest, divided by peaks and lakes and cliffs. As the road crosses the pass the appearance of the landscape changes abruptly. The plateau breaks away and opens the view onto the main ridge of the Uintas. From this vantage point they again have a somewhat Canadian Rocky appearance. The top has a name and elevation sign (10759ft) together with a turnoff to a picnic area and trailheads. Another sign just west of the summit labels the pass with its watersheds and gives it a rough 10700ft elevation. From South. (also described upwards) Rte150 heads south from Evanston and traverses farmland, not in a straight line, but zig zagging across the valley following property boundaries. This is the steep side of the Uintas, and they make an imposing backdrop of rounded forms to the farmland and distant buildings. The wide shoulders disappear as soon as the road crosses from Wyoming into Utah. Approaching the National Forest boundary a lodge also sells a miniscule selection of prohibitively expensive food. 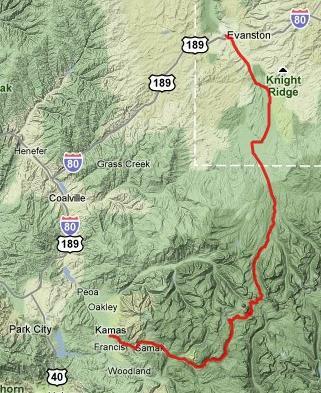 Otherwise - no supplies between Evanston and maybe something in Kamas. The road now parallels the Hayden Fork of the Bear River and starts to climb noticably. Traversing an area called Christmas Meadows near a ranger station, the distant panorama to the south east has something Canadian Rocky like to it, where the west face of Ostler Peak spreads its shadows over the pine covered hills and expansive meadows in the foreground. The grade picks up a bit. But without any major turns or anything remotely resembling a switchback, the road manages to climb what feels like a summit. This is where the Highline Trail, along with it the main Uinta ridge line crosses the road. Topo maps label this spot as Hayden Pass (10347ft), but there are no signs at this designation. Bald Mountain Pass is still a bit further, and this short section between the two passes is buy far the most scenic part of the ride. The road rolls along between peaks and small lakes, the largest of them named Mirror Lake. Climbing above the lake a turnoff leads to a viewpoint with the lake and Hayden Peak behind it, one of many really nice views along the way. Bald Mountain Pass x2: Wasatch National Forest boundary south of Evanston <> Rte150 <> Bald Mountain Pass <> turnaround point Yellow Pine Campground (and Slate Creek crossing) just a few miles short of Kamas: 87 miles with 6400ft of climbing in 6:5hours (Vetta100A r2:10.7.12). same summit points: just north of Lily Lake on Ut150 <> Ut150 north <> Bald Mountain Pass <> turnaround point: jct Ut150 - forest road to Soapstone Pass: 68.3miles with 57800ft of climbing in 6:11hrs (garmin etrex30 r4:17.6.7).